BMTC loses 6 lakhs/day to conductors? November 22, 2011 : Today, I decided to blog about all the irregularities that I see around me and take action against it. I will keep updating the blog if anything productive happens after that. 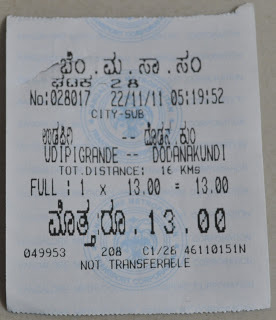 Here is the first one with BMTC (Bangalore Metropolitan Transport Corporation). I was traveling from Coimbatore to Bangalore on 22-Nov-2011 and got down at Silk Board Bus Stop. I need to catch a local bus from Silk Board to Marathahalli. I generally prefer to travel by Volvo buses only. But there was none at the time. Early morning at 5 AM, with such a chill climate, I decided to hop onto the local bus. Complaint: Ticket was not given, unless I asked for it. The bus was crowded and I was standing near the last row. I asked the conductor, “How much does the ticket cost to Marathahalli?”. He said, “10 Rupees”. I gave him 10 rupees and was waiting for the ticket. He distributed the tickets to passengers going to other destinations, but not to me. One more guy asked for Marathahalli and he did not get the ticket either. When the conductor was about to move away, I stopped him and asked for a ticket. He said, “Give me three more rupees”. I looked at him hard and gave him 10 rupees. He scolded me for not giving him exact change, issued the ticket and moved away. The other guy also stopped him and got his ticket. The bus was too crowded, that I did not get into a discussion, but decided to lodge a complaint anyway. I just made a few assumptions and did small math. Around 6200 buses run in BMTC alone. Consider that Silk Board to Marathahalli is not even half the trip distance for the D5 bus, the conductor already cheated Rs. 20. Assume Rs.10 to average and at least 10 trips in a day for a bus, the amount that BMTC loses to its conductors is 6200 X 10 X 10 = Rs. 6,20,000/day and for an financial year it turns out to be a whopping amount of Rs.22,63,00,000 = Rs. 22 crore approx. Yes. I know what you are thinking. Not all the conductors are like that. OK. Also, the amount that I assumed Rs.10 is very less. Let’s change the % of fraud conductors and see what happens. 50% - 11 crore approx. 25% - 5.5 crore approx. 10% - 2.2 crore approx. You might save a few bucks traveling without tickets, but see how much BMTC is losing?. Who are they to steal our hard-earned money? We are not talking about the few bucks. We are talking about the crores of rupees. With proper re-investments, we can have better infrastructure and maybe even a reduction in the ticket price. Would you stand with me? What to do, if you find any irregularity with the BMTC? Inform him/her that you are going to file an online complaint with BTIS. If possible, try to capture his/her picture or at least get his/her name. Please note the Route No and the Bus Registration No. Go to this link www.btis.in and file a complaint. Make sure that you register a complaint every time, you come across a situation. What could BMTC do to stop the irregularities? BTIS could give us a compliant number rather than a simple “Thank You”. It would be easy to track or to use RTI to get the updates. Frequent Ticket Checking on the routes where you receive more complaints would be needed. If there is a hot-line, the passengers can call and lodge a complaint right from the bus. The Officials can talk to the conductors right on the spot. Because there is NO proof that can be produced for any of these complaints. There is some positive feedback that BTIS actually acts on all the complaints. Let’s see what happens!